New Year, New Life, Let’s Do this! As I look back on this past year (something we inevitably do because we are humans and not goldfish) I feel like I only had half of a year, because the first six months were given to cancer. January to June was nothing but cancer. I know I said I wouldn’t talk about it anymore, but hey, it did dominate my life for 181 days solid (and still floats in the background now, and will for at least the next five years thanks to medical due diligence). Frankly, this pisses me off. But, I will say this – I am grateful to cancer for one thing… ok, two things, the first being not killing me, but the SECOND thing is creating a sense of urgency and imbuing deep value into every moment I’ve lived since. I’ve become a lot more efficient and less willing to pass up opportunities. On the fun side of things, if I see ads for a live-show or a convention I want to attend, I book the tickets and GO. If my wife comes up with a sudden idea for super-fun-time-right-this-second, I take her up on it. We live a little more in the spontaneous lane and it is awesome. On the smart side of things, I actually plan for the future now. I pay my bills IN ADVANCE. I have savings. This is an amazing feat unto itself. I’m counting calories (not as much as I should, but I’m getting better at it). My wife and I are actually taking serious baby-steps toward home buying (something I had historically dragged my feet on). We’re working together to figure out a health regimen for both of us. I lost six months of my life and I’ll be damned if I’m going to lose any more. We went to Geek Girl Con… and it ROCKED!! I gave a lift to three hitchhiking tourists and didn’t die! We saw Keith Apicary Live, and we danced like idiots with him. And it ROCKED! We attended ZomBcon… and it was OK.
We saw Wil Wheaton and Paul and Storm Live… and they ROCKED!! We saw The Muppets opening day and again two days later and it ROCKED TWICE!! I visited NYC, ate the meal of my life, sang with Jimmy Fallon, schmoozed with a bunch of drunk Santas, saw a show about D&D (and it had actually had a DRAGON!! ), and saw Follies with Bernadette Peters… and the entire experience FREAKING ROCKED!! And on New Year’s Eve tomorrow night, for the first time in YEARS, my wife and I will be attending an actual party. Bonus – it’s with two of our friends we also haven’t seen in years. This ROCKS! I am so excited for next year I’m actually afraid to say just how excited I am lest I jinx it, or Murphy makes an unwelcome appearance. Going to the Oregon Shakespeare Festival to see my best friend in one of the shows. Should add, seeing my best friend who I haven’t seen since my wedding over four years ago! Flying to Chicago to watch my best friend (the same from above) get married!! And that’s just what we already have tickets for. I can’t wait to fill out the rest of the year with adventures! Thanks so much for sticking it out with me this last year. I hope you’ve enjoyed my anecdotes and observations. I look forward to sharing more with you in 2012!! Merry Holiday of Gift-Giving That’s Not Your Birthday! 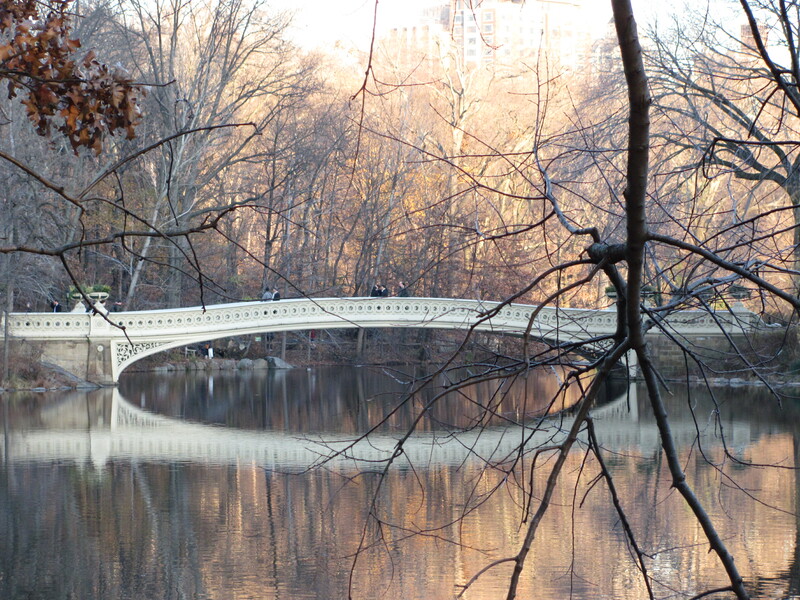 New York Really IS a Wonderful Town! 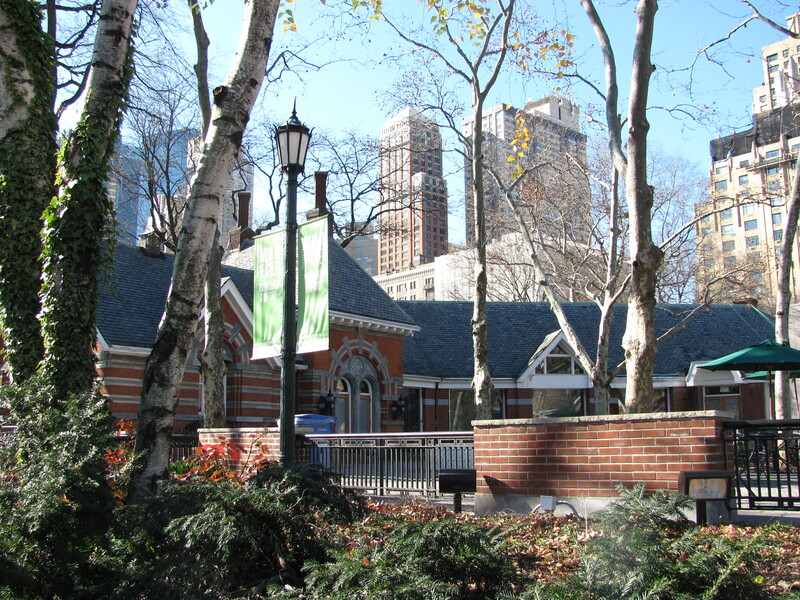 Okay, let’s talk about New York City. This was one of the most EPIC trips to The Big Apple I have ever experienced and most of that “epicness” occurred in the first 8 hours of being there. 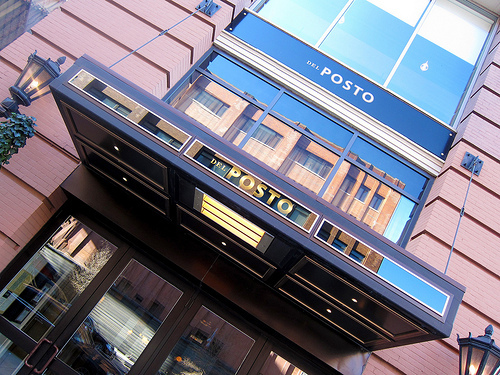 It all started with dinner reservations at Del Posto in Chelsea. I was with two friends and we were totally ready for a night of eating fancy and pretending to be sophisticated and crap. After about two seconds of thought, we ordered the 7-course tasting menu and thus commenced to eat fancy food for THREE AND A HALF HOURS as well as devouring two AMAZING bottles of wine thanks to our incredible Sommelier, Lacey. Also, you want to make a sommelier’s day? Ask about orange wine. Seriously. It’s like a super-secret-squirrel thing and sommeliers totally geek out over it. I’m all for anything that makes people geek out. So, there we are, at Del Posto, having the dinner OF OUR LIVES and of course there is a piano player and at some point around the 4th course he starts playing “One” from A Chorus Line and the table next to us starts singing along. So, we spontaneously start singing along, and now there’s seven of us singing along at the top of our lungs, much to the consternation of the “aren’t we special we’re rich” diners around us, but we don’t care because this is awesome and we’ll never have the chance to do this again… ever. So there. So the song ended and we’re smiling like idiots, and Lacey-the-Sommelier brought us another bottle of wine, and we all dug into the next course. Then, the OH EM GEE continued because as we were about to get course number 6, the table next to us gets up to depart. 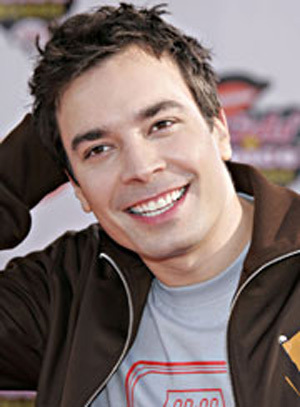 We barely noticed until one of the guys stopped on the way out to turn around and say he really enjoyed sitting next to us and that guy turned out to be JIMMY (FREAKIN’) FALLON!!! He got excited and pointed at me happily, “Right?! So funny!” Then he thanked us again for being so much fun to sit next to and wished us a great evening. Then we all sat there going, “Holy crap that was Jimmy Fallon” for the next two courses. Is it still a photo bomb if the intended focus of the picture is aware of the bombing? I don’t know. Who cares. This was the most awesome photo bomb ever (next to THIS one, of course). Forget Reindeer - In NYC Santa rides the subway! 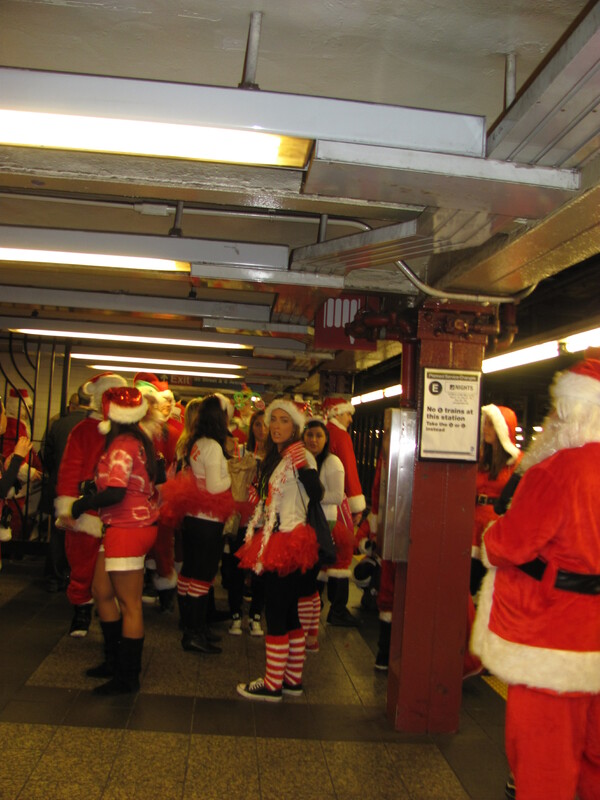 A SEA of Santas and elves and other Xmas-y dressed types flooded the subway out of nowhere, and they were all completely jolly and totally drunk… at 11am. Naturally, I took pictures and asked questions. Was this an Improv Everywhere thing? Something else? The hysterical thing was, none of them knew. Several of them said that they had just staggered home from pulling all-nighters and saw other people in Santa outfits drinking, so they cobbled together their own (or bought a cheap one on the fly at Walgreens) and joined the party. Only in NYC, for reals. Turns out there was something called “SantaCon” going on and part of the festivities involved a city-wide pub-crawl. Ho-Ho-Holy crap! In TriBeCa I caught a matinee of the Off-Off-Broadway show She Kills Monsters at the Flea Theatre and it was insanely good. In a nutshell, the show is about a woman, Agnes (played by Satomi Blair), whose parents and younger sister Tilly (played by Allison Buck) all die tragically in a car accident. What a way to start a comedy, right? Anyway, Tilly was a huge D&D player and Agnes, in attempt to get to know who her little sis was, picks up Tilly’s custom module and starts to play, and things get really awesome really fast. She Kills Monsters.. and so does she... and she... and she... and also him. 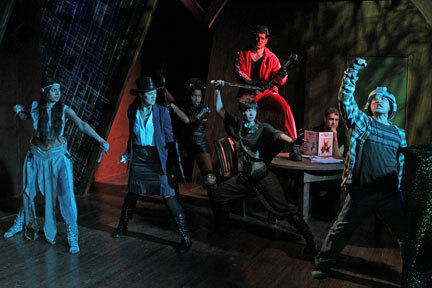 The production was fast-paced, extremely well-acted and wonderfully creative and there was even a DRAGON!!! Leaving TriBeCa on a theater-high, I headed back to the hotel to meet up with my friends, grab a quick dinner, and head to the Marquis Theatre on Broadway to see Follies! Was Follies amazing? Yes it was. Was it incredibly sweet to get to see Bernadette Peters live on stage? Yes it was. Was the production perfect? Almost. 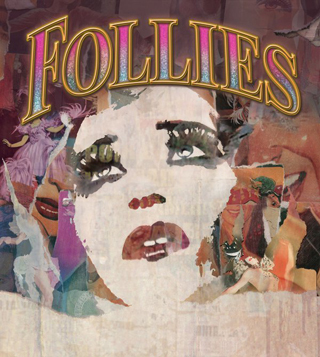 I’ve been very lucky to have had a number of “revelatory” theatrical experiences over the years, and I was hoping that this production of Follies would be another. It wasn’t. Overall Follies was absolutely spot-on, Broadway-at-its-best, but I must admit (and it pains me to do so) Bernadette was miscast. The character of Sally is a tough nut to crack, and I think Ms. Peters made some unfortunate choices in her approach and ultimately, it wasn’t a good fit. I can think of a couple of other actresses who would have KILLED in the role, including Patti Cohenour, who (if you’re a serious theatre-nerd like me) you would be familiar with from The Light in the Piazza (among a BUNCH of others). But, ce’st la vie, it wasn’t Patti, it was Bernadette. Now, don’t get me wrong, Follies was intensely good. Major stand-outs for me were Danny Burstein as Buddy and Terri White as Stella (who brought the house down with the show-stopper “Who’s That Woman?”). Also Jan Maxwell was exceptional as Phyllis and Elaine Paige was fun as Carlotta, the character who sings the famous “I’m Still Here” belt number. (By belt, I mean vocal, not wardrobe). The set was SPECTACULAR, the pre-show sound design was inspired and the transformation into “Loveland” was theatre magic at its best. It was at this point that the “epic” quality of the weekend started to fade and become just another great time in the city. Sunday, our last day, once again I split off with my travel-friends so they could go do the “tourist-y” stuff, while I headed to Central Park West to meet up with an old family friend. I arrived uptown earlier than planned, and spent a good hour just wandering around Central Park, and taking pictures of places and things I’d seen many times, but never bothered/thought to photograph before. 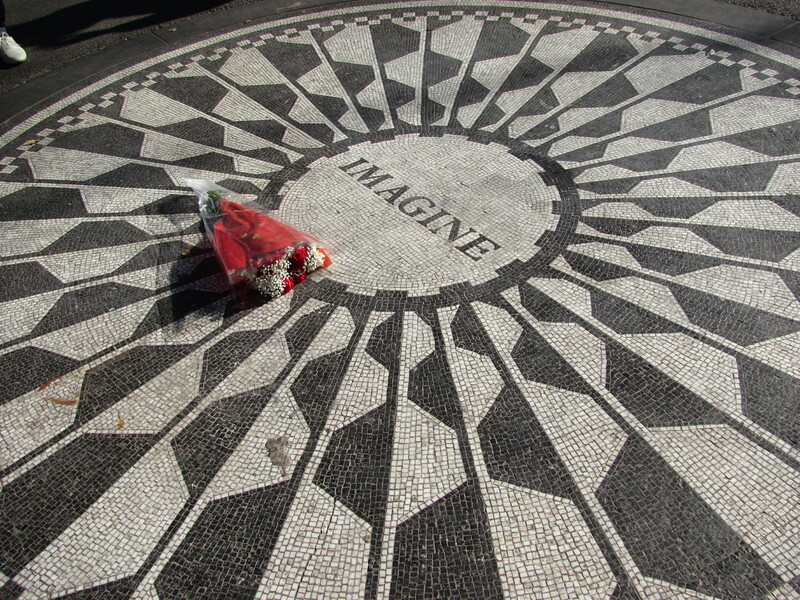 As I neared the 72nd and Central Park West entrance, I remembered that it was only a few days after the anniversary of John Lennon’s death, so I paused at the Imagine Mosaic and took a quick picture there. Someone had left flowers. They always do. I found that comforting somehow. After brunch with friends, it was time to head out of town. It had been quite a trip. It’s Up to You, NY, NY! So this is neat. I’m going to be in NYC next weekend. 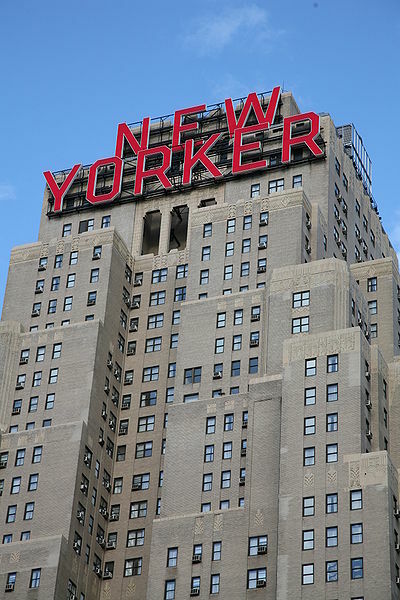 I’ll be staying at The New Yorker Hotel, which is also neat. It’s located in the Garment District, which is cool if you’re into Project Runway. 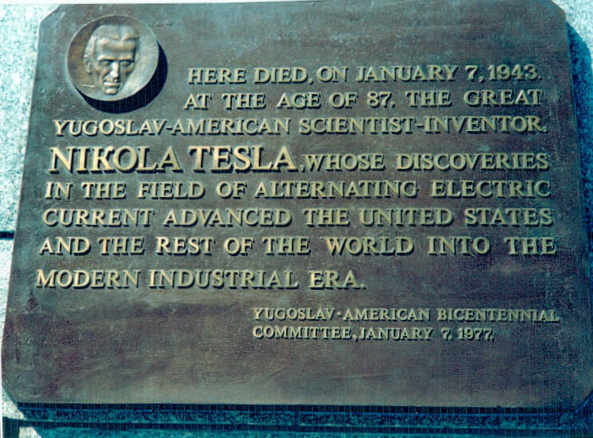 But it’s also the location where, in 1943, Nikola Tesla up and died… and that is GEEK HISTORY, MAN!! Other bits of, “No way! WAY?! So cool!” history associated with the hotel include Spencer Tracy staying there, as well as Joan Crawford, and both the Glenn Miller Orchestra and Tommy Dorsey Band played there regularly. 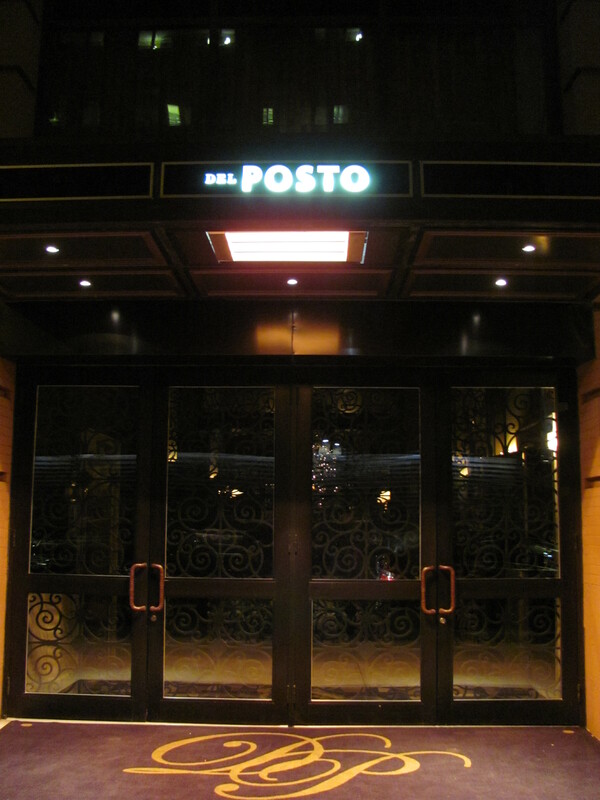 While in the city I will be having dinner at Mario Batali’s Del Posto. Mario is originally from here in Seattle, and the local boy has done very good, so it seems fitting to visit one of his many places where you put food in your mouth. 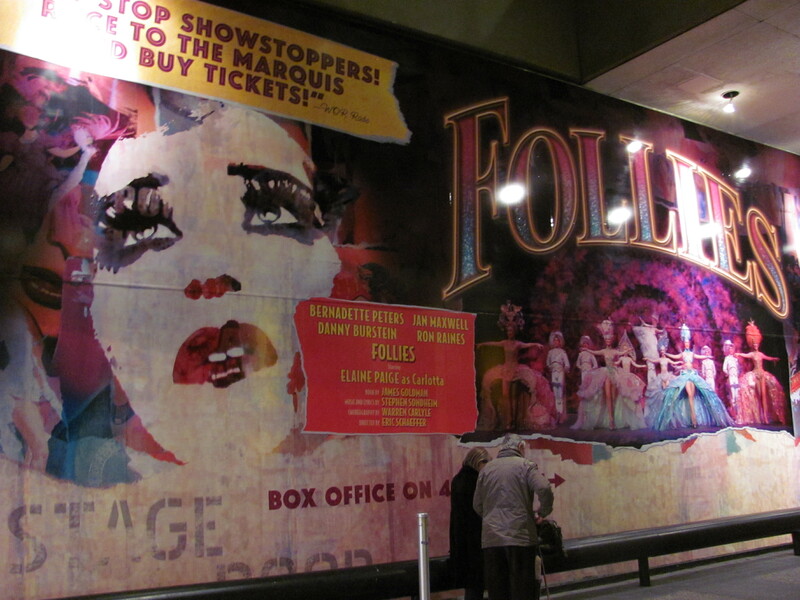 What I am most excited about though, (being a proper theatre nerd) is seeing Follies! at the Marquis Theatre. I am a HUGE Stephen Sondheim fan, and while it also would have been awesome to see The Book of Mormon, they are sold of tix until April of next year (even for the crap seats)… and I was afraid that the same would be true for Follies!… but we got really lucky with some pretty decent last minute seats. I am so excited to see what has been hailed as one of the (if not THE) finest productions of one of the greatest musicals EVER WRITTEN. 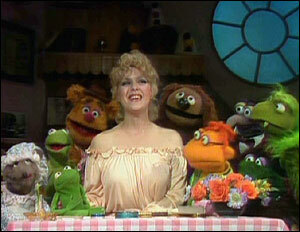 On top of that, the star performer is Bernadette Peters! She is Broadway Royalty! Bernadette with my favorite fuzzy, felt-y, people! Not only is she Broadway Royalty, but you could argue that she is royalty because of her association with Sondheim musicals. Sondheim himself has praised her as “flawless” and she has appeared in numerous productions of his shows over the span of her career, going all the way back to when she was just 13 and understudying “Dainty June” in the second nat’l tour of Gypsy – for which Sondheim had written the lyrics. So, the prospect of seeing HER in one of Sondheim’s greatest works on BROADWAY…well… I’m trying hard not to vibrate out of my seat from the excitement. This is my umpteenth trip to NYC. 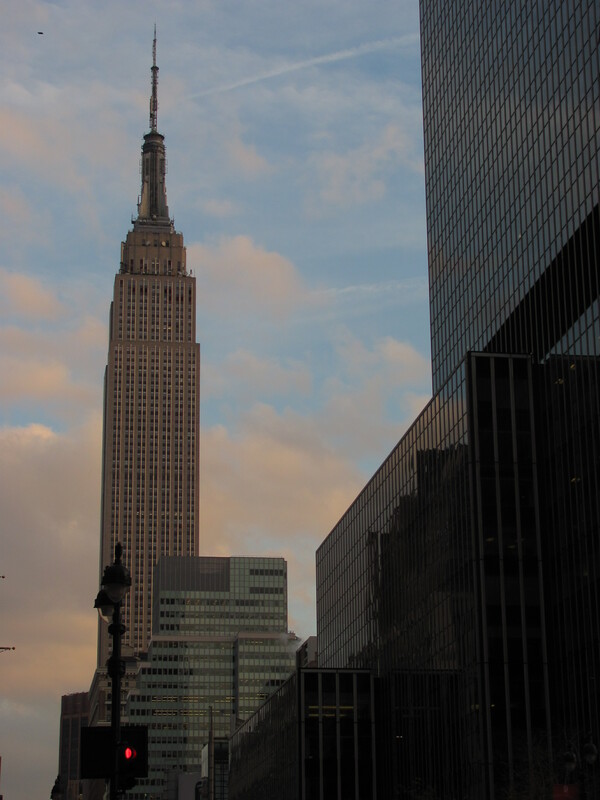 It’s one of my absolute favorite cities to visit (would NOT want to live there, though…I’m way too west coastie to handle the pace) and there’s something so nice about going to a place as large and complicated as NYC and feeling totally comfortable navigating the landscape. It’s kind of like having a vacation cottage in the woods to get away to, except the cottage is a multi-story hotel and the woods are Central Park. I’ll be sure to take photos and share my experiences when I get back! You can also follow my Twitter Feed to see what I’m up to when I’m in the city next week.